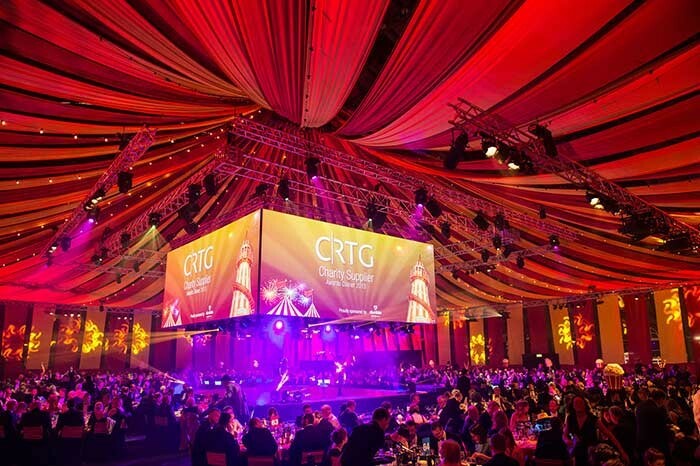 Manchester lighting specialist dbn supplied rigging, lighting equipment and design plus bespoke draping for the Co-Operative Retail Trading Group (CRTG) annual Supporters Awards and gala dinner event, which was staged at Manchester Central. Pete Robinson project managed for dbn. Both he and the company have been involved in the event for the last six years, each time working closely with technical production management providers A To V and also directly with the client, to interpret their brief and help bring the venue alive with the unique atmospheres required. This year, the venue was split into two sections. A fully operational fairground was installed in one half, and the dinner for 1000 people into the other. The dinner area featured a stage in the centre of the room and dbn was asked to create a circus Big Top visual effect, which they did using hundreds of strips of red and yellow casement material. First, dbn’s crew worked with installed a series of concentric square formatted trusses in the roof to facilitate lighting positions and anchor points for the draping, and also to fly four conjoined 10 x 4 metre projection screens, which moved in and out above the stage during the evening. The perimeter of the dinner area was draped with red and yellow banners and a scenic roof was created above the tables using the same material – hung between the trusses bordering the area and the most central square truss at 16m high. The result – which consumed around 3.6 kilometers of material – looked stunning! Inside the Big Top, several more trusses were hung in square configurations, starting with the perimeter ones which were each 45 metres long and ending in a square of 3 metre long trusses which formed the apex of the Big Top material runs. Clay Paky moving lights were chosen to light the Big top space, with 24 Sharpys bringing style and pizzazz to the occasion, together with 16 of the new Sharpy Washes all rigged on the trusses or sitting on the stage floor. They were joined by 16 Alpha Wash 700s and 16 Alpha Spot QWO 800s, rigged so they could provide both audience/table and dancefloor lighting. These were augmented with a selection of ETC Source Four profiles, PARs and 2k Fresnels which were also used to light both the stage and dancefloor / table areas. Eight 2.5k Studio Due City Colors stationed in the corners of the room were used to throw lighting onto the red and yellow roof canopy. For control, dbn supplied a Jands Vista T2 console running with an S1 wing which was operated by Mark Jones. 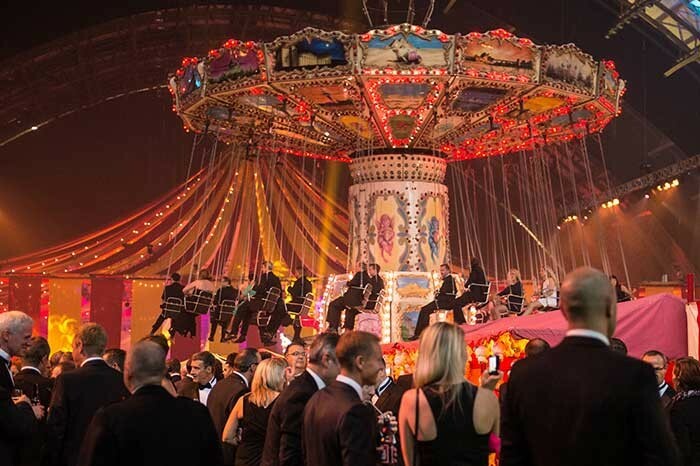 Above the fairground, two trusses were flown to give lighting positions and these were populated with a variety of PARs and profiles with breakup gobos to enhance the vibes. Seven of the venue arches in this area were each illuminated from a floor pod at either end containing a Clay Paky GlowUp battery-powered LED uplighter, an Alpha Wash 575 and an Alpha Beam 700. Data distribution to these moving lights was done via the DMX output of each GlowUp in each pod, signal to the Glow-Ups being distributed wirelessly, which was a neat time-saving solution that dispensed with the need for any signal cable between the pods. A tight timescale was the biggest challenge on this event, with a noise curfew in place during the build day prior to the show pushing noisy activities into night shifts. Dovetailing with all the other technical departments on site was also tricky as well as getting the 192 runs of fabric looking just right, with a large number of motor chains and cables running between them, this was a task needing time and diligence!